Controversy, drama and on-track excitement aplenty meant that the down-to-the-wire 2007 season was one of the most exciting in recent memory, and all this without a certain seven-time world champion on the grid. Changes for the new season meant a return to a single tyre manufacturer after Michelin announced its withdrawal the previous season. It would also be the last season for every car to use traction control since 2001. On the driver side, Lewis Hamilton was generating considerable excitement prior to the start of the season after it was announced he would partner reigning world champion Fernando Alonso at McLaren. Few could have predicted the sparks that would fly between the team-mates. Kimi Raikkonen, who pushed Alonso close during the 2005 season, had left McLaren for Ferrari and the Finn began the season in style by taking a lights to flag victory on his team debut. Equally impressive was Hamilton's third place finish in his first grand prix, the Englishman finishing behind team-mate Alonso. Felipe Massa took his first pole of the season in Malaysia but Alonso won his first race with McLaren ahead of Hamilton, who continued his impressive rookie form to finish second. In Bahrain and Spain Massa made the most of his pole positions to record successive victories, with Hamilton finishing second in both races. In doing so, he become the first rookie to finish on the podium in his first four outings. McLaren would dominate Monaco with Alonso winning from Hamilton after the pair lapped everybody apart from Massa's Ferrari. The Canadian Grand Prix heralded Hamilton's first victory in F1 after a dramatic race. It started with the second all-McLaren front row after Hamilton took his first pole position. Alonso made a mistake in turn one, losing several places as Hamilton opened a gap between himself and Nick Heidfeld. On lap 22 the first safety car period began after Adrian Sutil hit the cement wall. The safety car pitted on lap 28, but before the lap could be completed Robert Kubica escaped relatively unharmed after a massive accident. His car, unstable with a damaged front wing, hit a bump on the grass that launched him into the air and into a massive impact with the retaining barrier at a peak G-Force of 75G. Testimony to the strength of modern day F1 cars, Kubica emerged concussed but unscathed. He would only miss one race. Lewis Hamilton fever hit Silverstone for round 9 of the season, and although the crowd favourite secured pole position, he could manage only third behind Raikkonen and team-mate Alonso. The European Grand Prix saw Lewis Hamilton's run of consecutive podiums come to an end as Alonso won again from Massa and Red Bull's Mark Webber. The first signs of team unrest at McLaren surfaced during a controversial qualifying incident in Hungary. Alonso held Hamilton up in the pit lane, denying him a chance to record a final lap time. Stewards later dropped Alonso five places down the grid to sixth place, with Hamilton starting in pole position. McLaren were also told they would lose any constructors' points they won and Hamilton duly took a lights to flag victory with Raikkonen coming second. On to round 11 in Turkey and Massa took a dominant lights to flag victory from Raikkonen and Alonso. Hamilton picked up consolation points for fifth after a tyre problem ruined his chances of a podium finish. Alonso dominated from pole in Italy ahead of Hamilton and Raikkonen and when the Finn won from Massa and Alonso in Spa, only 13 points separated the top three. Hamilton still held the championship lead by two points over Alonso and few seriously expected Raikkonen to overcome the McLaren duo. An earlier than usual Japanese Grand Prix at the Fuji Speedway was marked by treacherous weather and started under safety-car conditions. 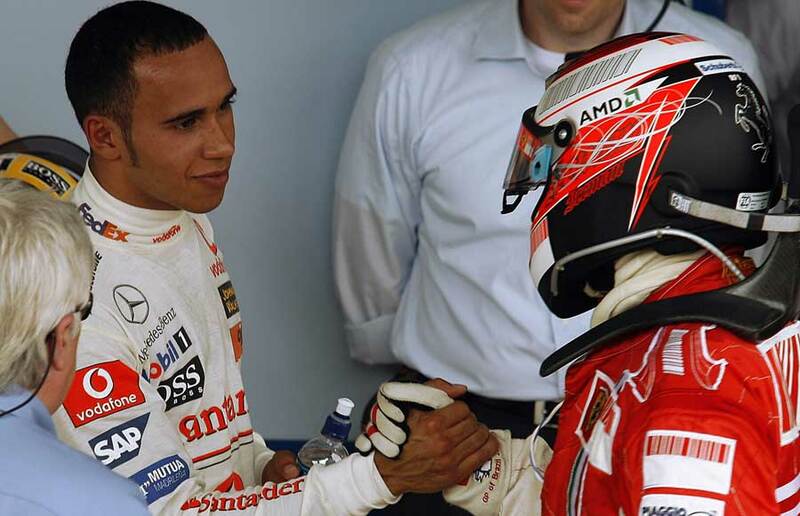 Hamilton survived a brush with Robert Kubica to win from Heikki Kovalainen and Raikkonen, making him overwhelming favourite to win the title against all odds in his first season. He now led the championship by seven points from Alonso with Raikkonen a further five points adrift. Having shown no signs of nerves all season, the enormity of what he was about to accomplish caught up with the young Brit at the penultimate race in China. The initial signs were good after Hamilton started the race on pole and led up to lap 28 when he was overtaken by Raikkonen on an increasingly wet circuit. Entering the pitlane to change to intermediates, he spun off and beached his car in the adjacent gravel trap. Raikkonen went on to record Ferrari's 200th grand prix victory with Alonso adding to Hamilton's woes with a second place finish. And so to a dramatic season finale in Brazil, which marked the first time since 1986 that three drivers had the chance of becoming world champion. Hamilton still remained favourite with 107 points followed by Alonso on 103 points and Raikkonen the outside bet on 100 points. Hamilton started from second but dropped back after being hampered by a gearbox problem. He recovered to 7th but Raikkonen drove a flawless race to win from Massa and Alonso. In winning his first drivers' title, Raikkonen became the first driver to take the championship from third in the standings entering the final race since Giuseppe Farina in 1950. Ferrari had already clinched the constructors' championship in Belgium after McLaren were excluded from the standings as a result of an espionage controversy dubbed 'Spygate'. McLaren had been found guilty of receiving technical documents of their rivals courtesy of former Ferrari employee Nigel Stepney. It was later fined US$100 million by the FIA.